Produced by the Institute for Economics and Peace, the Global Terrorism Index provides the most comprehensive metrics and summary of global trends and patterns in terrorism to date. The fifth edition continues the tenacious effort by IEP to measure and understand the impact of terrorism which is increasingly imperative to 2017’s global climate. 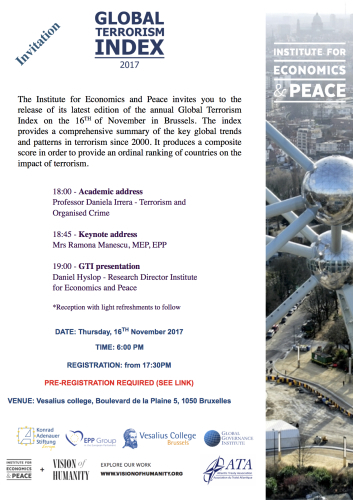 The program will kick off with an academic address given by Daniela Irrera, elected president of the European Peace Research Association and professor of Terrorism and Organized Crime. Mrs. Ramon Manescu’s expertise as a three-time mandated Member of the European Parliament will supplement the discussion as Europe’s response to Jihadism remains her political focus. Daniel Hyslop, Research Director of the Institute for Economics and Peace, will present the report’s key findings followed by a question and answer session. The 2016 full report is available HERE. We hope to welcome you all and kindly ask you to confirm your participation by registering online HERE.